THE TRUTH ABOUT BENEFIT FRAUD AND WHAT THE GOVERNMENT WONT TELL YOU! The Government have launched yet another campaign earlier this year to crack down on those who claim benefits, who are claiming fraudulently and purported to cost the taxpayer 16million a year. Every single opportunity they get we are told there is a scrounger in every street across the country yet the facts don’t really back this up. The government has turned people in society against each other with relentless stories of the ‘fake’ or ‘cheat’ lurking in your neighbourhood. They have turned some into amateur sleuths and doctors who feel it is their civic duty to turn in Mr Jones across the road because he leaves at 8am every morning without actually knowing the person circumstances, I mean after all he could be going to hospital for chemotherapy every day or radiotherapy, or even visiting a sick relative who needs care first thing in the morning! In many people’s minds their hard-earned taxes gives them the right with full backing of this government, the justification to often in many cases report people they think are claiming when they should not be. As a campaigner I see this in action from those who are being oppressed by this government on a daily basis people who think the neighbour across the road is getting something which they have failed to get and disability hierarchy kicks into a debate of the deserving and not deserving culture this government has done very effectively using divide and rule tactics and the use of subtle language , not seen for many years. See Links at bottom of this blog for media links. The hotline itself has a ‘success’ rate of 4.4%, but only if you include over-payment through error (although there is no report on how much is identified through the hotline as under-paid through error, or even if the DWP corrects this through back-payments). That’s about double the overpayments generally in the benefits system, so the general public aren’t doing too badly (they only get 95% wrong). But it essentially means the DWP is waiting for a (potentially malicious) call to decide who to investigate; risk-profiling, on the other hand, means deciding to investigate someone because they are part of a high-likelihood group, which one would hope is both more accurate and less affected by public whims. Of concern though is not just whether this is the best way to tackle fraud but the culture it creates. Everyone knows fraud is wrong, that doesn’t need changing. The public already (wrongly) thinks fraud is very high, that doesn’t need changing either. The hotline seems to be doing pretty well at receiving calls (even if over 95% are wrong) so maybe that doesn’t need changing either. What does need changing is the stigma and demonisation of claimants, and this campaign won’t help that. 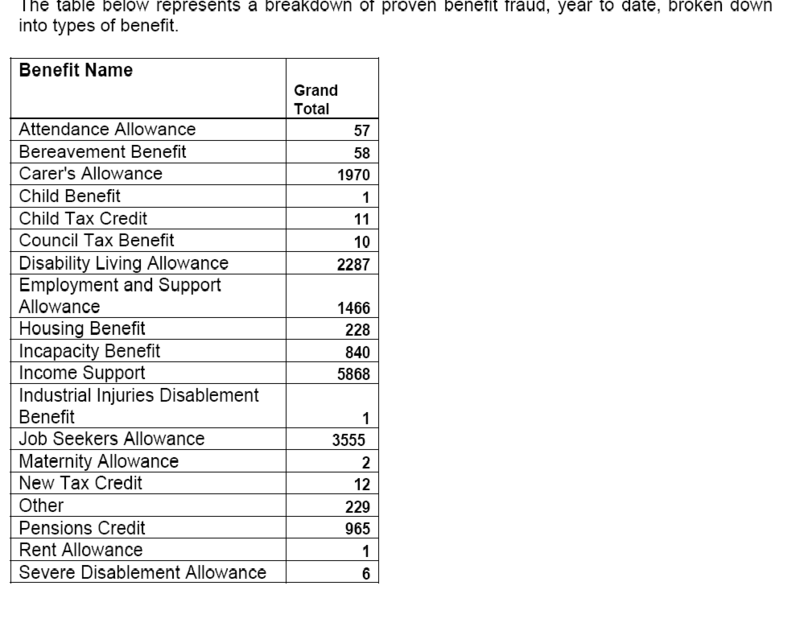 The lies the public are being told is an absolute outrage and is a complete falsehood, so I banged out a FOI as did another colleague at Welfare Weekly (an online news service) to the DWP asking for facts and figures regarding benefit fraud. 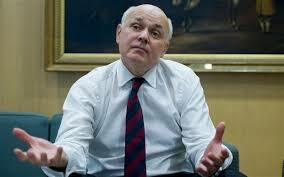 To my horror my beliefs were accurate as this year there have been 17,732 claimants across all benefits in the UK which is by no means acceptable but from a realistic view of the millions of claimants disprove IDS’s ideology that everyone is on the fiddle, when realistically he doesn’t have a clue . It is like any other system in this country which will be abused by some, while most claimants are decent honest law-abiding citizens. The amount of calls the government gets regarding fraudulent activity is phenomenally the opposite polarity it is so shockingly high that they must be working 24/7 flat out on zero hours with matchsticks to keep their eyes open. If you wish to download a copy then you will need to go and search for the numbers 4468 and 4456 on the website link below. Please bear in mind the statistics have not been quality assessed to government approval so should be treated with caution.The culture of hatred and demonisation of benefit claimants is perpetuating high volumes of false accusations. Public perceptions of benefit fraud is sky high which wrongly motivates people to report others. Benefit fraud investigators are waiting for (potentially malicious) calls from members of the public to decide who to investigate. Risk-profiling, on the other hand, means deciding to investigate someone because they are part of a high-risk group, which can be more accurate and is less affected by spurious or unfounded accusations.Of concern is not just whether this is the best way to tackle benefit fraud, but also the culture of hate and suspicion it creates. Fraud investigators are receiving several thousands of accusations of benefit fraud from members of the public, and yet the vast majority are proven to be false or incorrect.While investigators review allegations, those reported face benefit delays and may be forced to turn to food banks. DWP also admit they don’t record how many people make malicious allegations – mainly due to the anonymity they provide accusers – and take no action (legal or otherwise\ against those who do. The DWP says malicious allegations are “unlikely to occur”. “We are unable to confirm the number of claimants who have been incorrectly reported to be claiming benefits fraudulently, and who have their benefit payments docked or suspended as a result of this information, because this information is not recorded. 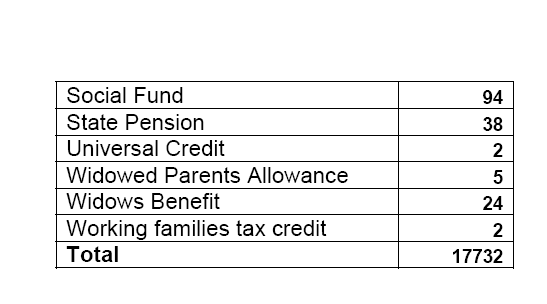 The second table is continuation of benefit fraud by benefit. So as you will see the figures are somewhat misrepresented in the media with one aim only , to remove the safety net from the people who most need it and the slow death of the welfare state and the introduction of more private insurance and restrictions, while those in power to make lots of money and their chums in the Banking and Insurance industries. Lets make 2015 a Capitalist free zone and stop the greed and help those in need. UPDATE: I hasten to add there are many reasons why simple mistakes on forms can lead to a claimant being accused of fraud, people can be prosecuted for benefit fraud for forgetting to inform DWP/Council of ANY change in circumstances,not all of these people have either deliberately set out to defraud. It can be someone who doesn’t understand what they have to do because they have difficulty processing information given to them, or they cant simply read and write but are afraid to say so. The rhetoric of this government is everyone claiming is a liar and cheat which simply isn’t the case.